With spring here and warmer weather on the way, many of us start craving light, fresh meals. Fish is a great option for when you want a healthy, light-yet-filling dinner or lunch and is also impressive when made for guests. 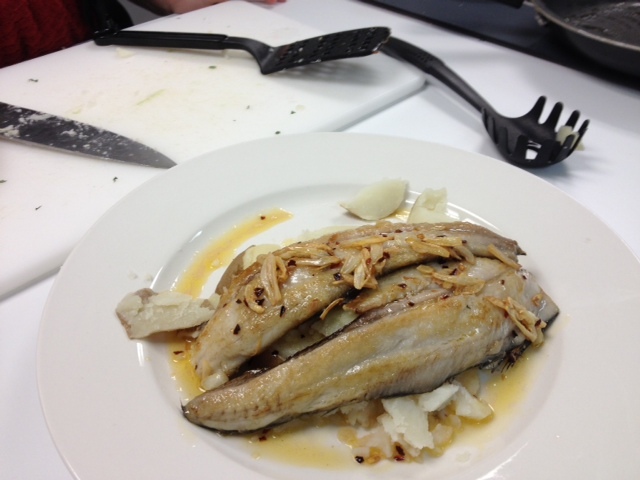 Fish is a great change to the typical meal rotations; however, it can be very intimidating to prepare, especially for students just learning to cook. 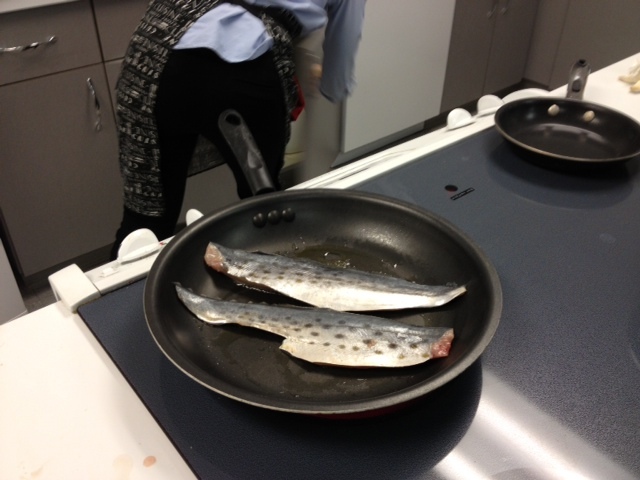 At the Healthy Cooking On a Budget class two weeks ago, RD Lauren Ferraro along with Sustainability Coordinator, and trained chef, Sabrina Pashtan showed the students that preparing fish doesn’t have to be intimidating or expensive. What makes fish such a great option? Like it’s meat and poultry counterparts, fish is a great source of protein. 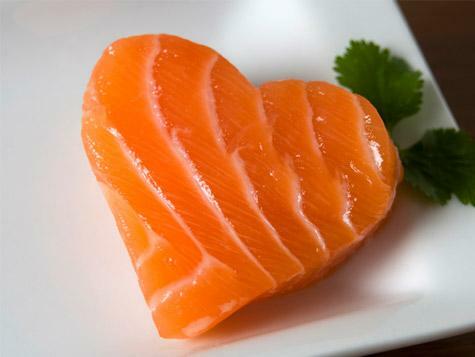 But what makes fatty fish, like salmon and tuna, really stand out is their omega-3 fatty acid content. These fatty acids are essential, meaning you have to get them through food – your body can’t make them itself – and play an important role in immune-function and heart and brain health. In addition to omega-3’s, fish is a great source of Vitamin A and D, a vitamin many Americans are not getting enough of in their diets. 1. Mercury content. This is especially important for women who are pregnant or who may become pregnant. While all fish and seafood contain safe amounts of mercury, some fish contain higher levels that may be damaging to an unborn fetus. The fish with the highest mercury ratings and should be avoided are shark, swordfish, and mackerel. Examples of fish with low mercury ratings include salmon, flounder, haddock, and whitefish. 2. Food safety. 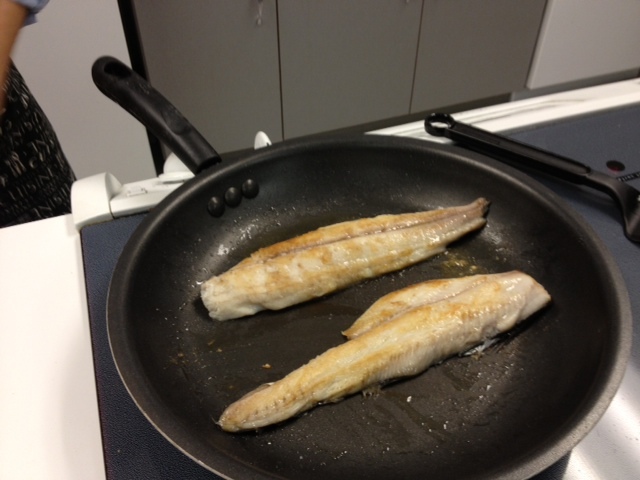 It is important to store and cook fish at the correct temperature to prevent bacterial growth and foodborne illness. Always cook above 140 degrees F and refrigerate under 40 degrees F. Don’t keep uncooked fish in the fridge longer than 2 days. If you’re not going to eat it right away, place it in an airtight container and store in the freezer. 3. Sustainability. There has been a lot in the news recently about sustainable fishing and for good reason. Sabrina, our sustainability expert, addressed two of the key issues in sustainable fishing: fishing methods and farmed vs. wild. Different fishing methods have different effects on the aquatic environment. Some methods, such as longlining, have high rates of bycatch, meaning turtles, sharks, and even sea birds can get hooked. Others like trawls and dredges are unsustainable because they damage the seafloor, destroying many sea creatures. Sustainable fishing methods include: harpooning, trolling, traps, and pots. When used, these methods cause little to no habitat disruption and little to no bycatch. Farmed vs. Wild. Neither is 100% of the time more sustainable than the other. It all depends on the farming methods used, the origin of the fish, and how the wild fish are caught. Some farms use methods that pollute nearby water and/or destroy previously existing habitats and are therefore unsustainable. Another issue with some fishing farms is the introduction of exotic species that, if they escape, can out-compete native fish and result in destruction of the local ecosystem. However, some farms do practice sustainable farming methods. Seafood Watch (checkout our previous post on the app) is a great resource for finding out which kinds of fish are safe and sustainable. On the website they also have free print-out pocket guides for fish for each region oo the US — definitely worth checking out before buying or ordering fish. For more information on choosing sustainable fish and seafood, be sure to visit Monterey Bay Aquarium Seafood Watch, Marine Stewardship Council, and the New England Aquarium. In general, it is cheaper to buy a whole fish and cut it up yourself rather than buying cut pieces from the store. When buying fish, freshness is indicated by eye clarity and firm skin. Fresh vs. Frozen: Is one better? Sabrina brought up this question consumers may have. Her advice: buy fresh. Typically the fish available in the frozen section are not among the sustainable varieties. Also, with frozen fish you have no way of knowing how many times it’s been thawed and then re-frozen. 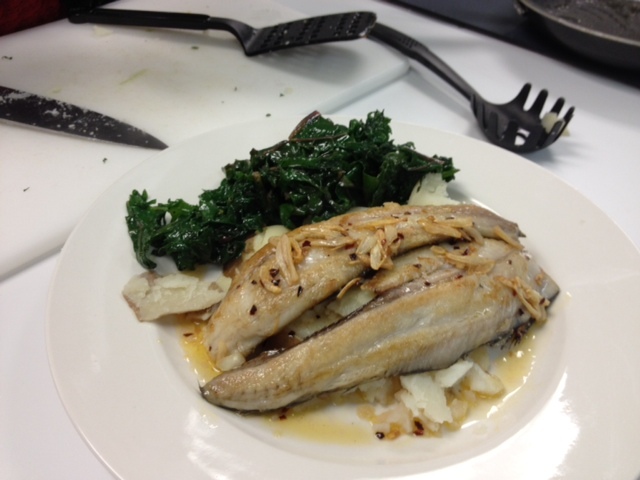 At the HCB class, Sabrina prepared pan-seared sofrito using Spanish Mackerel, served over boiled potatoes and kale tossed in a French vinaigrette. 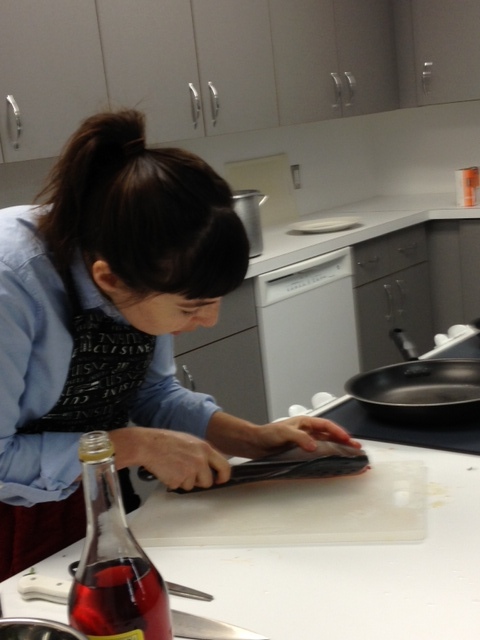 The recipe is for if you have a whole fish, if you buy filets, skip the first steps. The directions for cutting the filets are from Sabrina. For sides, Lauren boiled potatoes and placed the fish on top of them so that the sauce poured over both the fish and potatoes. She also served the dish with kale since it was the cheapest green option, but this dish would taste great with spinach or mixed greens as well. 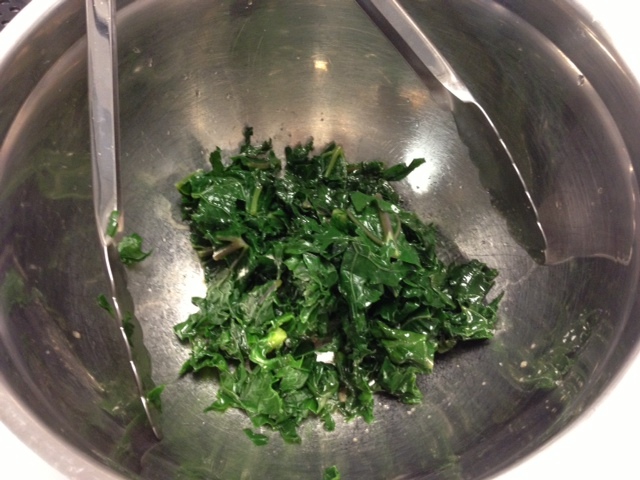 The kale was quickly blanched then dressed with a French vinaigrette, the recipe for which is below. 1. With scissors, cut off the tail and fins. 2. Then take the scissors and make an incision down the belly and then remove the inners. 3. Finally, cut parallel to the gills (this will make removing the head easier) and remove the head. 4. 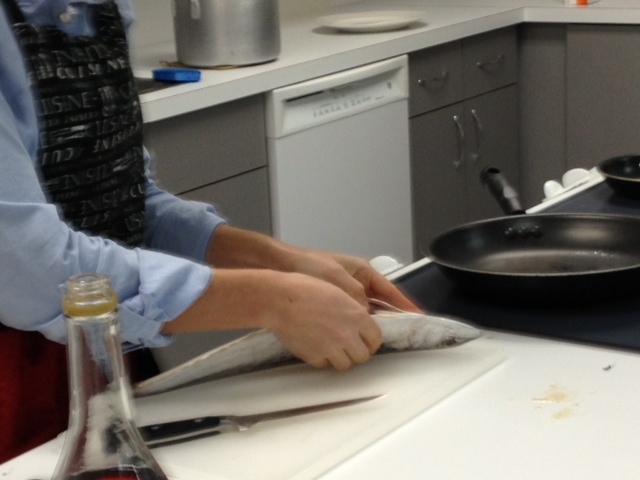 Using the spine as a guide, filet each side of the fish. Resulting in two filets. 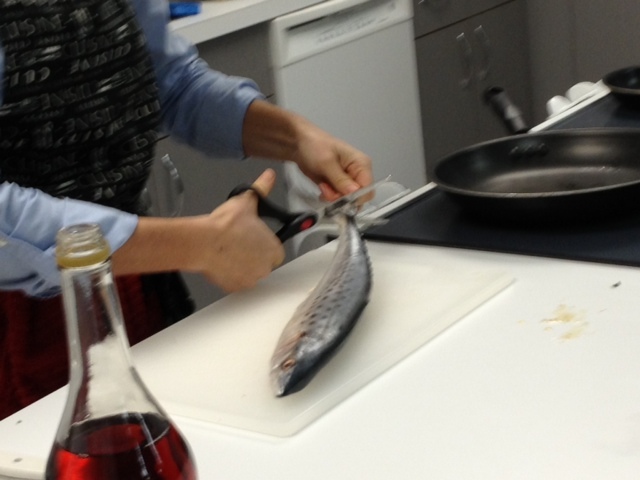 A filet knife is ideal for this, but if you don’t have one, use a long, sharp, flexible knife. 5. When you look at the filets you will notice a red patch on the meat that was touching the inners, cut this off. 6. Generally flaky white fish have small bones. 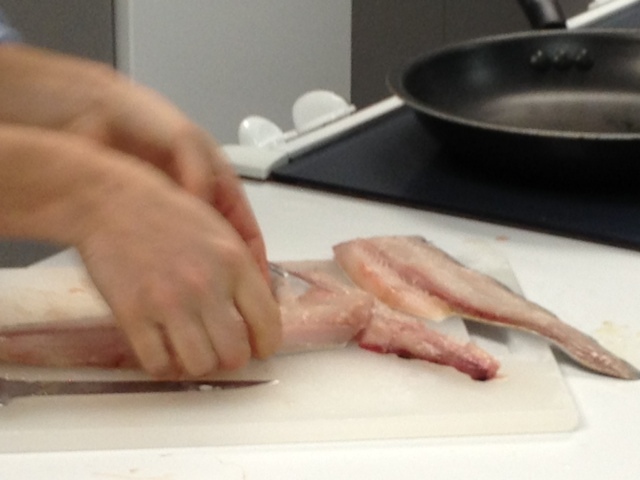 It is okay to cook the fish without removing them, but if the bones bother you, use tweezers to remove them. 6. Flip over, and if thicker than ½ inch, place in a preheated 400 degree oven for 5-10 minutes, depending on thickness. Do NOT use a Teflon pan in the oven for roasting, only stainless steel. 7. While fish is cooking, slice garlic into filets and place in a small sauté pan with olive oil and crushed red pepper. Cook until golden then remove from heat. Add red wine vinegar, mix, and pour over cooked fish. 8. Served with boiled or roasted potatoes and greens.